Make Money FALL IN LOVE with you!! you from being irresistible to money. sign up for this FREE four-part video series. You’re new to the work, or on a micro-budget, or you prefer to work on your own, at your own pace. You’re on your way but feeling stalled. 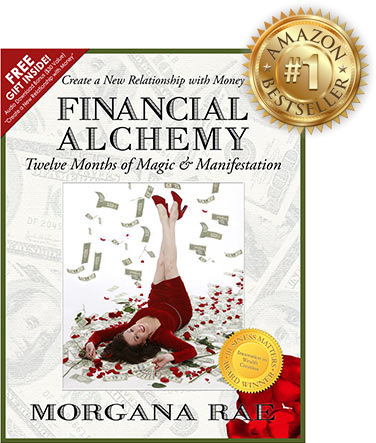 You’re ready for dramatic breakthroughs in Money, Love, and Lifestyle. An invitation-only community of Powerful Women for an experience like no other. Obliterate your limits. Unleash your magic. Money is like any other relationship; it comes where it's invited and appreciated. It rarely comes when it's chased. When your life is full of settling, you aren't leaving room for what you really want. Alchemy is the art of Transformation: turning leaden human experience into spiritual - and material - gold. Sometimes Money expresses love by challenging you to be bigger and more creative than you see yourself. There's no magic in neutrality. Help me choose my path, Morgana! Assessment to help us direct you to what you need most NOW!